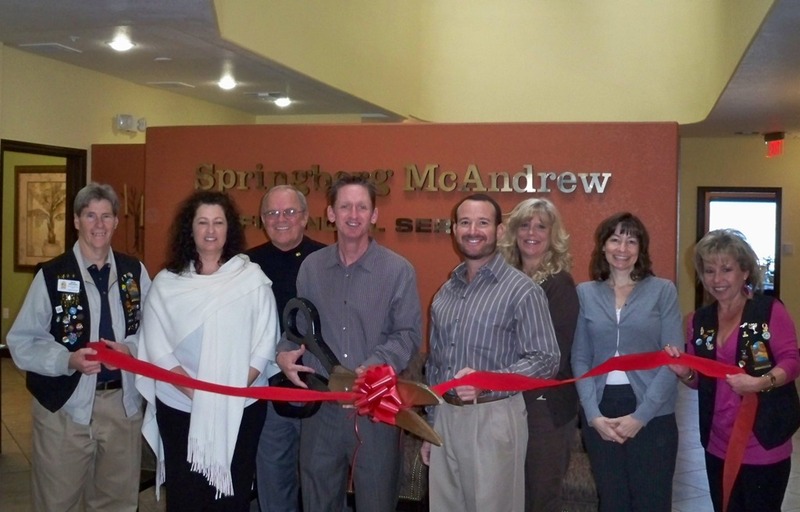 Springberg McAndrew Financial Services celebrate its 35th year membership anniversary with the Lake Havasu Area Chamber of Commerce Ambassadors. They are located at 430 El Camino Way and are specialists in the field of financial strategies and insurance products and services. Springberg McAndrew provides businesses, individuals, and financial advisors with a wide assortment of investment and insurance options. As an industry leader, seasoned staffs of licensed professionals help organizations build assets, enhance performance, improve operating efficiency and reduce risk through a wide range of insurance options, asset management and securities services solutions. On hand for the ribbon cutting from left to right are as follows; Chamber Ambassador Rick Broker, Kim Portz, John Nygren, Mike McAndrew, Brian Springberg, Lois Heath, Robin French and Chamber Ambassador Kathy Baumer. For more information contact them at (928) 855-9421.